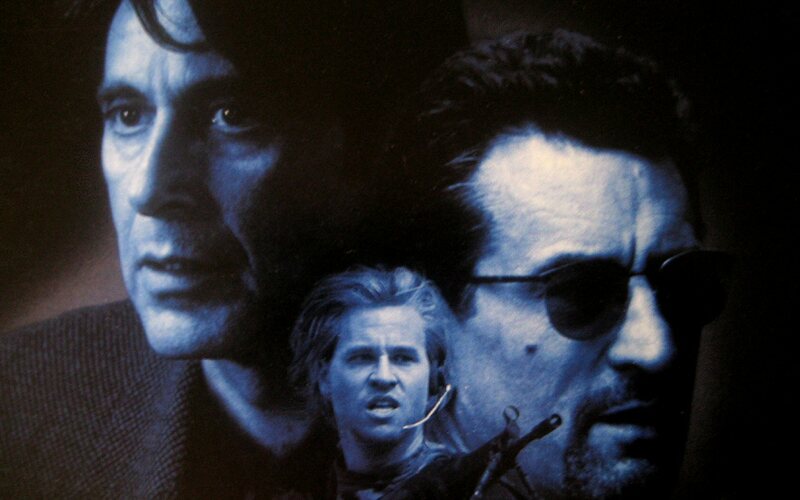 For many filmgoers and critics, the 1995 crime drama ”HEAT” is regarded as director Michael Mann’s masterpiece. It is the movie that most fans think of when the director’s name is mentioned. ”TIME” magazine had even placed it on its list of top 100 crime dramas of all time. And the brutal downtown Los Angeles shootout is considered to be one of the best action sequences in movie history. So . . . how do I feel about ”HEAT”? Like many others, I consider it to be one of the best crime dramas I have ever seen. Honestly. The movie centered around a cat-and-mouse game between a Los Angeles Police detective named Vincent Hanna (Al Pacino) and a ruthless professional thief named Neil McCauley (Robert De Niro). McCauley’s carefully planned heist of an armored car that contained US$1.6 million dollars in bearer bonds owned by a money launderer named Roger Van Zant (William Fichtner) goes slightly wrong when one of his crew – a trigger-happy cowboy named Waingro (Kevin Gage) – kills one of the armored car guards being held at gunpoint by the crew. Realizing they cannot leave behind any witnesses, McCauley’s crew is forced to kill the remaining guards. This multiple homicide, along with the armored car robbery, attracts the attention of Detective Hanna and his squad – members of the L.A.P.D. Robbery/Homicide Unit. Back in the late 1980s, Michael Mann had written a transcript for a 1989 made-for-television film called ”L.A. TAKEDOWN”about a cat-and-mouse game between a Los Angeles Police detective and a hardened and methodical criminal that affected a bank robbery in downtown Los Angeles. Following his success of ”THE LAST OF THE MOHICANS”, Mann took that transcript and broadened it for a theatrical movie that would become ”HEAT”. Mann’s screenplay featured a multi-layered and complex look into the lives of professional criminals and the police officers that pursued them. Through characters like the introverted thief McCauley and one of his co-horts, Chris Shiherlis (Val Kilmer), audiences received a glimpse into the lives of professional criminals that were neither mobsters or amateurish lone wolves. Men like McCauley and Shiherlis were just as organized as the Mob, but they did not come from any particular ethnic group like the La Cosa Nostra. The movie also offered a glimpse into their personal lives and reveal how their pursuit of crime affected their families and other loved ones. ”HEAT”also presented a parallel glimpse into the lives of police officers like Vincent Hanna, who led a special unit of detectives that investigate robberies and homicides. Mann took filmgoers into Hanna’s marriage. There, the director revealed how the detective’s intense dedication to his profession and temper affected said marriage. As I had earlier stated, ”HEAT” is a complex tale filled with intriguing characters and multiple subplots that served the movie’s main plot. Well . . . some of the subplots accomplished this task. The one plot that dominated the movie (and served as the only plot for Mann’s ”L.A. TAKEDOWN”) was the clash between Hanna and McCauley that culminated in a downtown Los Angeles bank robbery and its aftereffects. Through his script and direction, Mann provided some memorable moments in the film. I found myself impressed by the scene that featured McCauley and his crew being double-crossed at a local drive-in theater by men working for money launderer Van Zant. Another scene that impressed me was the more dramatic quarrel between Chris Shiherlis and his wife, Charlene (Ashley Judd) over his gambling habits. The scene served as a reminder on how the activities of criminals end up affecting their lives on a personal scale. One favorite scene featured an amusing, yet crowd-pleasing moment when Hanna realized that McCauley had become aware of the squad’s presence with his own investigation. But the movie’s tour-de-force remains, of course, the famous shootout in downtown Los Angeles, following a bank robbery committed by McCauley and his crew. I could rave over the excellence and excitement of the scene. But why should I bother? The sequence’s positive reputation amongst critics and filmgoers is a perfect reflection of the scene’s excellence. I can only think of a handful of similar action sequences – two of them from other Mann movies – that are this well shot. As much as I admire ”HEAT”, it has its flaws. One, the movie has a running time of 165 minutes. Now, this might not be much of a problem on its own. However, it does become something of a problem with a movie filled with what I consider to be unnecessary subplots that dragged the film in certain areas. I could have done without the movie’s romantic subplots. McCauley’s romance with a bookstore clerk/graphics artist named Eady (Amy Bremmerman) bored the hell out of me. Hanna’s marriage to a divorcee named Justine (Diane Verona) annoyed me. Well . . . her character annoyed me. I became weary of her constant complaints about his “dedication” to the job. This particular subplot had its own in the form of Hanna’s suicidal stepdaughter (Natalie Portman), who seemed incapable of dealing with her real father’s absence from her life. In the end, Hanna and McCauley’s personal lives seemed to have NO real impact upon the movie’s main plot and minor impact upon their respective characters. Worse, both subplots nearly dragged the film. Ironically, the two relationships that had a stronger impact upon the movie’s main plot turned out to be Chris and Charlene Shiherlis’s troubled marriage and the marriage between another member of McCauley’s crew named Trejo (Danny Trejo) and his wife, Anna (Begonya Plaza). Chris and Charlene’s marriage and feelings for one another played a role in Chris’ fate following the disastrous bank robbery. And Trejo’s love for his wife led him to reveal McCauley’s robbery plans, while being tortured by Van Zant’s men and Waingro . . . before they could tip off the police. And yet, these two relationships did not receive as much screen time as Hanna and McCauley’s relationships. Three other subplots failed to grab me. With Trejo and his wife in Van Zant’s clutches, McCauley was forced to recruit a driver for the bank robbery – a paroled convict named Donald Breeden (Dennis Haysbert). Unfortunately, Mann included a subplot that led Breeden to break his parole and accept McCauley’s job offer – a subplot that described the parolee’s difficulties in staying straight. I found the story a bore and a waste of Haysbert’s talent. And I never understood Mann’s decision to include Waingro’s murder of a teenage prostitute. Hanna and his team had never linked the murder to Waingro. Nor did the crime have an impact upon the movie’s plot, except force Hanna to abandon a dinner party with his squad and their wives . . . and give Justine another excuse to complain about his job. One last subplot seemed useless to me. It featured Hanna and McCauley’s only meeting at a local diner near, where each man examined the other and revealed that they would not hesitate to kill the other if the situation demands it. And while I must admit that Pacino and De Niro gave top notch performances, the entire scene struck me as a . . . waste . . . of . . . time. The only thing this entire scene had served was a chance to allow Pacino and De Niro to share one scene together. I realized that I had written so much about the movie’s plot that I nearly forgotten about the performances. Fortunately, Mann had cast the movie with talented actors and actresses and I cannot fault any one of them. I realize much has been said about Al Pacino’s tendency to engage in theatrical acting. In other words, he can be a ham. He certainly was a ham in”HEAT”. But the thing about Pacino is that he can be subtle or he can be a ham . . . with style. Which is why I am willing to give him a pass on some of his hammier moments. But I cannot deny that Vincent Hanna may be one of his best roles. Whereas Pacino’s Hanna is all fire and theatrics, De Niro’s Neil McCauley is quiet intensity. His McCauley must be one of the most subtle performances he has ever given. I cannot even remember a scene where he had raised his voice, let alone mugged for the camera. There were other performances that also impressed me – Mykelti Williamson as the no-nonsense Sergeant Drucker, one of Hanna’s teammates; Tom Siezemore as McCauley’s most loyal henchman, Michael Cheritto; Jon Voight as Nate, McCauley’s pragmatic fence; and Diane Verona as Hanna’s embittered wife, Justine. Yes I had complained about her character, but I must admit that Verona gave a memorable performance. However, I have to give special kudos to Natalie Portman’s emotional performance as Hanna’s suicidal stepdaughter who is desperate for her real father’s attention; and to Val Kilmer and Ashley Judd, who managed to give complex performances as Chris and Charlene Shiherlis – one of McCauley’s colleagues and his wife. Despite their constant clashes over his gambling habit and her brief foray into adultery with a Las Vegas resident named Alan Marciano (Hank Azaria), Kilmer and Judd made it clear that these two loved each other . . . especially in a quiet and tense scene that featured Charlene giving fugitive Chris a silent warning to stay away, due to the presence of nearby police. William Goldenberg, Dov Hoenig and Tom Rolf’s editing very impressive; especially in the downtown shootout. But there is one technical aspect of ”HEAT” that really knocked my socks off. I am speaking of Elliot Goldenthal’s score. Granted, most of Goldenthal’s score failed to make an impression upon me. However . . . his score for the bank robbery sequence was more than memorable. I enjoyed the way Goldenthal used percussion to underscore the scene’s growing tension that finally exploded into violence when Chris Shirherlis spotted cops and Hanna’s team waiting outside of the bank. For me, the entire sequence featured a perfect blend of music and action. To repeat myself, ”HEAT” is not a perfect movie, despite its reputation. I consider Mann’s septic view of Los Angeles to be one of the movie’s minor flaws. But its major flaw seemed to be the numerous subplots that had nothing to do with the movie’s main narrative. A flaw that ended up dragging the movie’s pacing in many scenes. But despite these flaws, Mann still managed to create an exciting and complex story about two men – a methodical thief and an intuitive police detective – whose cat-and-mouse game engulfed those in their lives and an entire city. It is this cat-and-mouse game that made ”HEAT” a recent Hollywood classic.